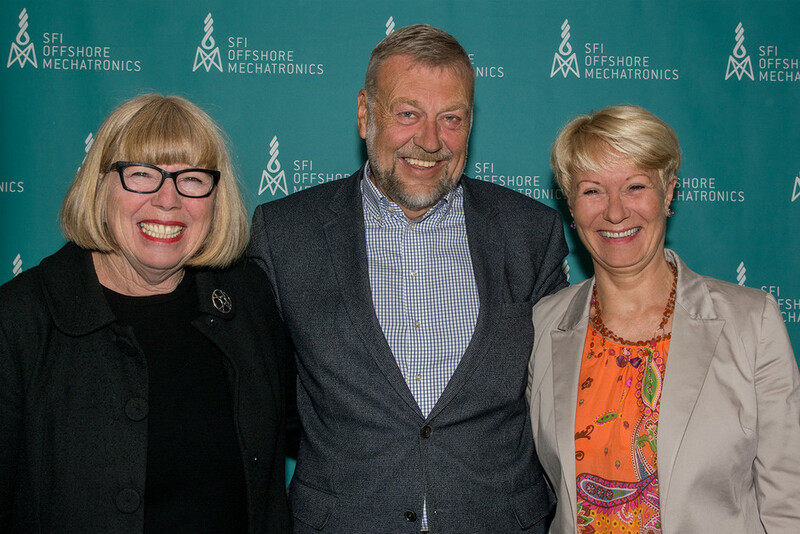 Wednesday April 22nd, 2015 the SFI Offshore Mechatronics was officially launched. 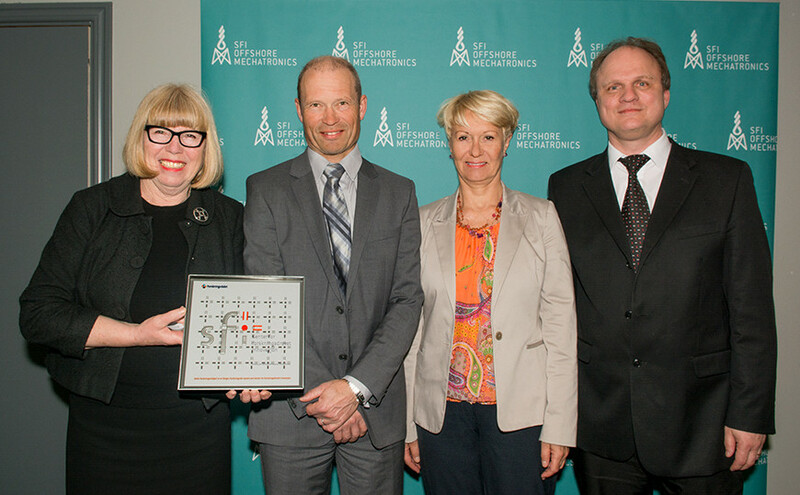 Rector (UiA) Torunn Lauvdal with the plaque from the Research Council which shows that the project Offshore Mechatronics has been awarded SFI status. Here together with Eirik Normann (Research Council), Anne-Grete Ellingsen (GCE NODE) and Faculty Dean Frank Reichert (UiA). – The cooperation between academia and industry makes it especially pleasing that Offshore Mechatronics is awarded SFI status, rector Torunn Lauvdal said in her opening speach. The event took place at Hotel Ernst in Kristiansand. Researchers, partners from industry and others were gathered to mark the opening of the centre. SFI Offshore Mechatronics will work on topics such as hydraulics, motion compensation, robotics, autonomy, monitoring techniques and data analystics. The goal is to develop and demonstrate methods, tools and solutions relevant for the industrial partners. The research council will contribute with 12 million kroner per year for a total of 8 years. Including the cash and in-kind contribution from the partners the total is about 200 million kroner to research, development and innovation during the period. A large number of Master thesis projects are normally linked to the SFIs. SFIs are normally able to conduct high-level PhD projects relevant for industry. SFIs normally attract significant international attention. SFIs enable development of long-term collaboration and alliances between the partners. SFIs contribute to an improved ability to innovate. SFIs strengthen the partners changes of getting future research projects funded. – We knew the need for restructuring in this industry would come. Investments in oil&gas do not give the same returns as before in the coming years. In this situation knowledge and competence are important for Norwegian industry, Siri Mathiesen, regional director NHO Agder, said. The partner companies pointed out the need for knowledge and innovation. The timing for SFI Offshore Mechatronics could not have been better. Now is the time to think long-term to make the technology sector within oil&gas more profitable and innovative. – Research is the tool – innovation is the desirable result, Johnny Olsen from National Oilwell Varco said. 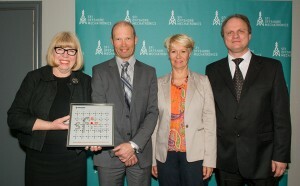 Torunn Lauvdal, Bjarne Skeie and Anne-Grete Ellingsen. On April 21 the General Assembly had it’s first meeting at UiA. In this meeting a board was elected, the preliminary budget for the first 3 years was presented, as well as the initial research plans for the same period. In addition and a few new members were elected into the centre. 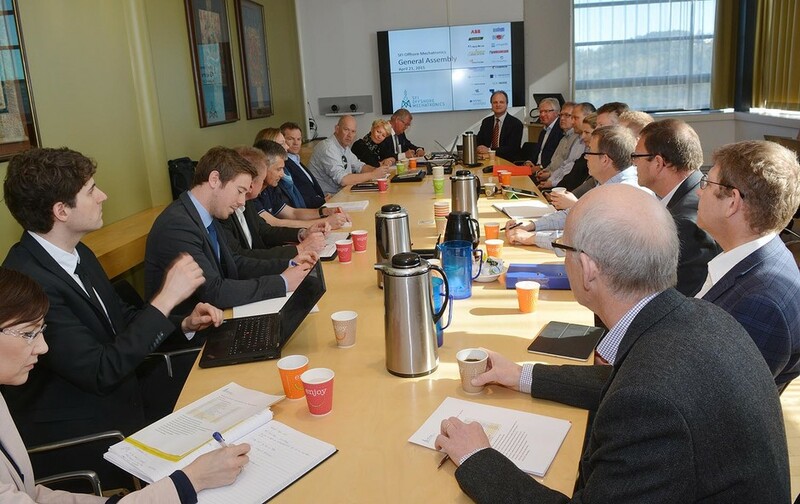 The General Assembly consists of the following members: Rein Terje Thorstensen (UiA), Kari Nielsen (Lundin Norway), Bjarne Sandrib (MH Wirth), Charlotte Skourup (ABB), Lena Skeie (Skeie Technology AS), Olav Egeland (NTNU), Stian Myhre (NOV), Klaus Schöffel (Teknova), Katharina Kjelland (Cameron Sense AS), Felix Strassburger (RWTH), Oddvar Skjæveland (IRIS), Øyvind Mydland (Stepchange), Anne Grete Ellingsen (GCE NODE). Additional representatives from: MacGregor, Applica, Devoteam, GCE Maritime, Aalesund University College, University of Aalborg. Observer: Øyvind V. Salvesen (Research Council). The General Assembly met for the first time on April 21, 2015 at UiA. This page was translated from a Norwegian article by Irene Hetlelid Svendsen (text) and Sara Ojanen / Tor Martin Lien (photos).